I hope you are all now well prepared for a strenuous weekend. On Saturday it is the Phil Hampton Memorial Ride, organised by North Hampshire CTC, starting in Medstead at 10am. Phil lived in Farnborough, was a keen member of Audax UK, and often rode with us, being a key member of the WSDA team that was highly placed in the CTC’s DAs’ Touring Competition: 9th in 1989, 2nd in 1990 and winners in 1991-3. Sadly, Phil was killed in 2002 by a lorry driver who was under the influence of drugs. The entry fee for this ride in his memory is a donation of at least £5 to the Cyclists’ Defence Fund. There is a choice of routes, 30 or 50 miles, see http://nhampshirectc.org.uk/phil-hampton-memorial-ride/. I am planning to do the 50, which ranges over the scenic Hampshire lanes to the south, out to Bishops Waltham and Hambledon. A treat! On Sunday we have our own ‘Bicycle Icycle’, starting from Mark’s house in Godalming at 9.30. Slightly shorter, but a bit more climbing. 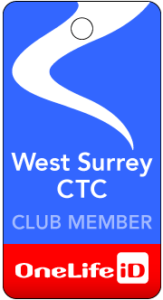 Details from our events page: http://westsurreyctc.co.uk/rides-and-events/cycling-events/. Two treats in a single weekend. Wow! Looking forward to seeing you there Chris, sadly weather not looking as nice as we had last Saturday. I know of a few others who’ve signed up so might be a good turnout from West Surrey.